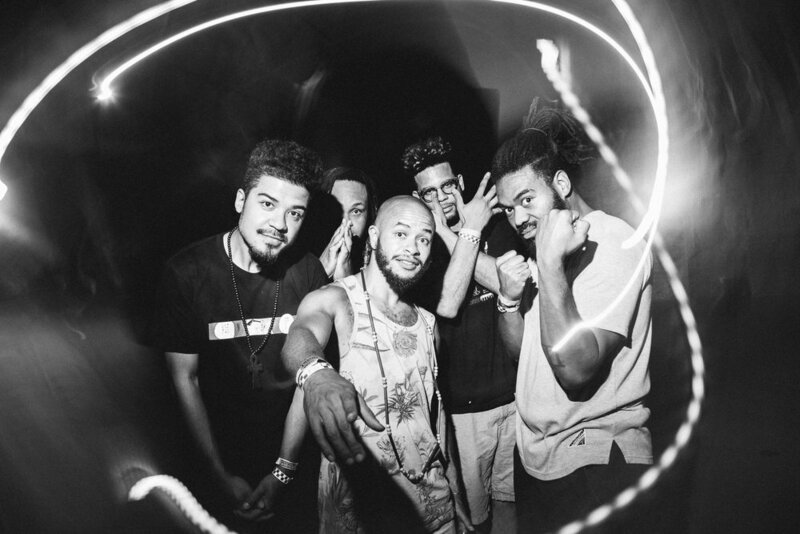 Arriving on the Minneapolis R&B scene in 2014, hip-hop collective Astralblak, formally known as Zuluzuluu, has since made a meaningful impact on the community and elevated the local soul and afro-futuristic music scene. The group’s original name was inspired by the Zulu tribe of South Africa. They won 2016’s City Pages’ Picked to Click, an annual poll of best new Twin Cities musical stars. They’ve toured with local rap artist Atmosphere, played Soundset, AfroPunk Festival and shared stages with innovators Thundercat, Shabazz Palaces, Tinariwen , Femi Kuti , Dam-Funk & Bun B., and were chosen by Minneapolis music legends Jimmy Jam and Terry Lewis to perform at this year’s Super Bowl Live. Made up of five musicians/producers: MMYYKK, Proper T, Greg Grease, DJ Just Nine & Art Parte, Astralblak’s new album Seeds encompasses all of what they’re already great at and more. Their style is ethereal yet bold, exploring new sound while incorporating elements of traditional funk, jazz and electronic music among their various synths, drums and other instruments. The upbeat, psychedelic funkiness of their songs are often combined with thoughtful lyrics about life balance and soul searching. Speak only matters from the heart,"
The song Seeds speaks on the importance of letting go and living in the present. Its meditative lyrics are paired with a symphony of instruments, most notable a soothing flute solo and synth breakdown. In Projection Mapping, Astralblak points to the inner self and provides perspective. This couplet is powerful in that it says so much in its two lines. So often are people caught up in the idea of wealth and status as equal to happiness and success. Yes, securing the bag is important and we all want to live with financial security. But centering your life around money instead of centering it around your soul is bound to end up badly. It’s vital to center yourself, remind yourself what truly matters, and train yourself to be still in life’s moments of chaos. I’m not completely sure why, but phrases like “Reclaim Your Power” really stick with me. The mantra is empowering. No matter how lost you may feel, wherever you are in your life, you can reclaim your power, you can reclaim your identity and you can reclaim your sense of self. The album provides plenty of poetic, moralizing tunes that make you want to rethink your own thoughts, but it doesn’t come without its bops. I always appreciate an album with a balance between deep, thought-provoking songs and ones you just want to feel and dance to, letting your body respond to the music more than your mind. Astralblak wants you to look inward and search for yourself while also celebrating the journey and the life around you. Coolers & Cocaine, Waves and Keep It Moving are jams that bring a retro funk sound so electric and captivating that you probably won’t be able to help nodding your head. Astralblak's Seeds releases digitally on Friday, November 16 and the physical CD releases on Saturday, November 24. For more, listen to Astralblak on Soundcloud, Spotify, Apple Music or their Bandcamp. Follow them on Instagram as well!